Cf. 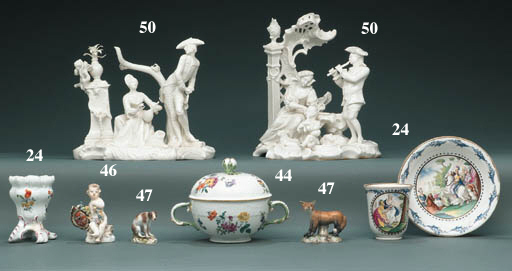 R.J. Charleston, The James A. Rothschild Collection at Waddesdon Manor, Meissen and other European Porcelain, London, 1971, fig. 39 for other examples of putti with shields and a note that 'Children, quite small, with little shields' are mentioned in the Preiss-Courante von Ordinairen Porcellainen records of 1765; see also, George Savage, 18th Century German Porcelain, London, 1958, pl. 61 for a Temple of Love, modelled by Kaendler in 1774 for Catherine the Great that has small putti holding shields at the bases of the columns, and p. 86 for mention of a Temple of Honour (Ehrenpforte) of 127 pieces for Augustus III and another of 264 pieces made for Count von Brühl.